What comes to mind when you think about lesson planning? If you're like most teachers, you focus on the material you need to present, what you will do and say, what you will ask students to do, and the assessments you will create and administer. And if you're like most teachers, you also know what it's like to be disappointed when this careful planning doesn't always lead to the deep understanding and mastery you'd intended. There's a better way to approach instructional design, says author and teacher-educator Anne R. Reeves, and it's within every teacher’s grasp. It begins with a simple mental shift from "planning for activities" to "planning for learning outcomes" and a critical concentration on learning objectives. Translate even the most inscrutable standards into strong, learning-focused objectives. Use effective objectives as the basis for excellent assessment. Craft engaging learning activities that incorporate both targeted content and necessary thinking skills. Pull objectives, assessments, and learning activities together into powerful plans for learning. Whether you're a novice instructional designer or a veteran seeking a new, streamlined process, this book is a must-read take on how to plan and achieve the excellent learning all teachers aim for and all students deserve. "I wish I had read this book the year I earned my teaching credential. . . . 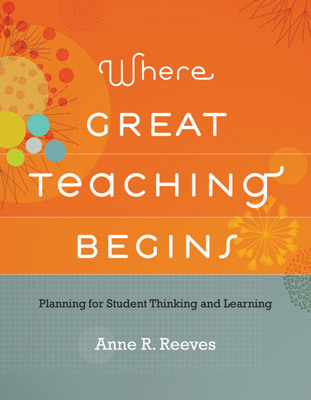 In addition to providing techniques that help teachers plan for student learning, Reeves offers great tips for explaining these techniques to fellow educators." —Grade 10 teacher Dave Orphal, Oakland, Calif.
ANNE R. REEVES is an associate professor of education and department head at Susquehanna University, a small, private, liberal-arts undergraduate college in Selinsgrove, Pennsylvania. She teaches introductory education courses to first-year students, teaches methods courses to seniors, and supervises secondary education students in their student teaching.